The Collaboration function in Rationale Extra allows users to share maps with other users with one mouse click. More information on this option you can find in our new Rationale Help here. In addition here under some tips on how to use this function. Only when 'Notifications?' in your My Profile its ticked, you will receive an email notification that someone has shared a map with you. First type the name of a group and give [Enter]. Next, copy/paste the usernames or email addresses of your group members, comma separated and give [Enter]. Finally, add the name of the group in the box at the top and give [Enter]. When you want to share a map with e.g. a class of students by using people's email addresses, make sure you have the email addresses that are connected to the accounts of the group members and they have ticked the option 'Email is Public'. When you share a map you can choose between 'Read/write' and 'Read-only'. The difference between Read-only as a separate option and Read-only within Collaboration is that a map with the status Read-only can be seen by everyone with the url/link. A map with the status Collaboration-Read-only can only be read by people/groups that are connected to this map; so this option is more safe. When someone has shared a map with you, you will see the map in the folder 'Shared with me' in your My Maps. The owner of the map has control. So, when he/she decides to stop sharing it with you, you will have no access any longer. The Revision History of the map is available to all with whom the map is shared. When you are a lecturer and ask your students to share maps with you, make sure that you have communicated the way they should name their maps. E.g. a combination of their own name, name of the assignment and version. Each change that is made in a map is visible for the other members of the group when they refresh their editor (F5). There is a chance that two changes being made at exactly the same time in a map will not be saved both, so some coordination - e.g. by Skype - is asked for especially when you are working with a bigger group. This will be solved when real-time working together is available late this year. Giving feedback on a shared map can be done on several ways: click on a box and add a note (Ctrl+A), click on the screen and type your text in a box, or add a Comment in the tab in the Text Panel. We will post a link to this blog post in the Forum too so that other tips on how to use Collaboration can be shared there. Our team is happy to announce that Rationale is now available offline! Our belief is that Rationale should be available to you wherever, and whenever inspiration strikes. Whether you are at your desk at work, at home on your iPad, or on your laptop in a lecture hall, we believe you should always have access to your maps in Rationale. With Rationale's offline capabilities, you can now design your maps while you are disconnected to the internet. (Some features, such as exporting rendered maps, are currently only available online.) Once your computer comes back online, we will sync all your maps with your account on our server. Offline mode makes heavy use of advanced features in HTML5 to further blur the distinction between desktop and browser-based software, bringing you the best of both worlds. The best way to get started with Rationale offline is to first install it via Google's Chrome Web store: https://chrome.google.com/webstore/detail/bndnccdbfffebclojcbfehijeacpdbme. 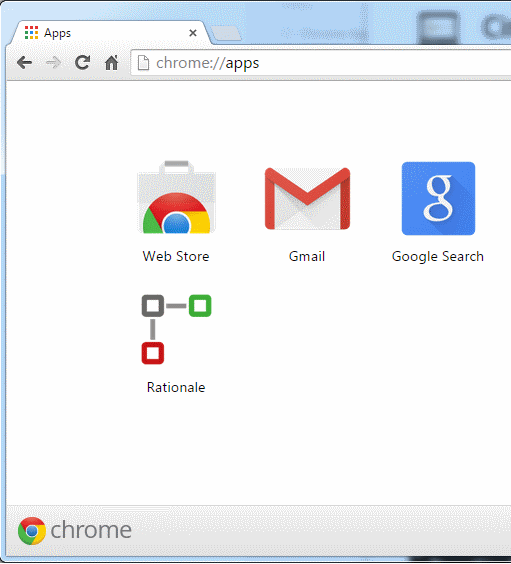 Once installed, you can access Rationale directly from the apps tab in your Chrome browser. The Chrome Web Store features apps that are pushing the limits of what browsers can do, just like Rationale does. Install the Rationale app and enjoy!